Located in the center of the city Residential property Omaxe Heights is the latest luxurious residential project in Faridabad offering all kind of facilities for a luxurious and peaceful stay. 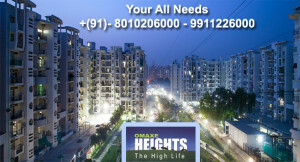 Due to the offered benefits, more than 800 families have already shifted in Omaxe Heights flats in faridabad. 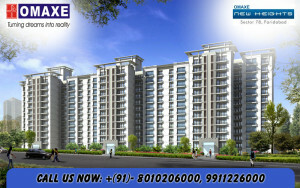 It is the best option to meet the need of a stress free and noise free lifestyle in the lap of the nature. You can choose from various options of units ranging from 2 BHK to 4 BHK as per your need and budget with the flat sixe varying from 1219 Sq Ft to 2350 Sq Ft. Reputed schools, medical units, markets all in close proximity. Advanced security camera with 24/7 gated security. Omaxe New Heights Flats in Faridabad is the place where the dream of luxurious home of every common citizen can be fulfilled. It is the brain child of Omaxe Ltd and with all the hard works and experience Omaxe Ltd brings you the option to complete your dream. Residential Project Omaxe New Heights Flats in Faridabad is designed as per the need of the buyers as it is available in 2 BHK, 3 BHK and 3+1 BHK with area of 916 Sq Ft to 1496 Sq Ft, so you have a wide range of option to choose from as per your requirement. Residential Property Omaxe New Heights is located in sector 78, Faridabad, which is surrounded by all kind of necessity like markets, schools, health units etc. Omaxe New Heights have great option for 2 BHK flat size 953 sqft the individuals and the entire flat are designed with leading as well as attractive designs which make many people admire it is the best property in greater Faridabad.